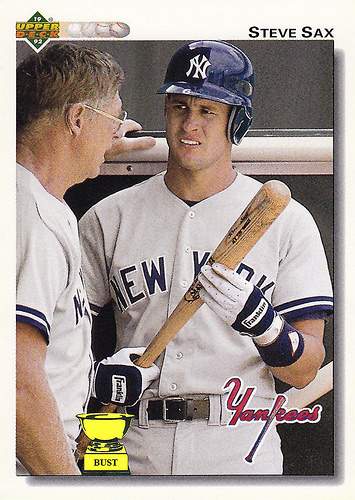 By the time John Habyan got to the Yankees he had learned the hard way that it was best to keep his emotions in check. The Bay Shore, New York native was drafted by the Orioles in the third round of the 1982 draft right out of St. John the Baptist High School. He then impressed everyone during his quick climb up the O’s farm system and by 1985, this right-hander was getting shots with the parent club. He later admitted that he was overwhelmed by the experience and and had difficulty staying calm and composed on the mound. He got his best shot with Baltimore in 1987, appearing in 27 games, including 13 starts for a very bad Orioles’ ball club. He went just 6-7 with an ERA near five and then he separated his shoulder in a winter sledding mishap. So by the time Baltimore gave up on Habyan and he was traded to the Yankee organization in 1989, he had learned his lesson. No more being in awe of big league hitters and no more letting his emotions effect his pitching. He convinced himself he hated every hitter he faced and he learned how not to get too excited when a manager handed him a baseball. He also worked hard to improve his slider. These were great adjustments on his part. He got his ticket to the Bronx in 1991 after pitching well in Columbus the season before. His first year in New York was Stump Merrill’s last and his 4-2 record and 2.30 ERA in 66 appearances was one of the few bright spots in an otherwise dismal Yankee season. He and closer Steve Farr combined to give New York a great chance to win whenever the team’s substandard offense was able to give them a lead to protect in the late innings. Habyan then started out the 1992 season just as hot and new Yankee manager Buck Showalter told every reporter who would listen that this guy was the best setup man in the game. But it didn’t last. Habyan started getting hammered after the 1992 All Star break as hitters no longer had trouble squaring up on his slider. New York gave him a chance to recover the magic in 1993 but when it didn’t happen, he was traded in a three-team deal that put reliever Paul Assenmacher in pinstripes. After pitching for four different teams in the next three seasons, Habyan’s big league career ended in 1996. He eventually became the head baseball coach at his old high school on Long Island. He shares his birthday with this former Yankee second baseman and this former Yankee outfielder. Bob Watson was a very talented Yankee GM who hated working for George Steinbrenner. But before the Boss’s constant undercutting and criticism sent his blood pressure through the roof, forcing him to quit, the guy known as “Bull” made some outstanding moves for New York. Take the 1996 Yankee roster as an example. It was the beleaguered Yankee GM who engineered the trade that brought Tino Martinez and Jeff Nelson to the Bronx from Seattle. It was Watson who got Joe Girardi in a deal with the Cubs. Watson’s the guy who signed Mariano Duncan as a free agent that year and it was Duncan who led New York in batting average during the 1996 regular season. Watson got Cecil Fielder from Detroit and he also picked up Charlie Hayes, David Weathers and the indomitable infielder, Luis Sojo. If you followed the Yankees during that 1996 season and you look at the names of the players mentioned above, you realize just how much Watson’s general managing contributed to that year’s World Chamionship. Oh, and I almost forgot, in June of 1996 Watson also acquired today’s Pinstripe Birthday Celebrant. At the time, the Yankees were looking for another left-handed bat to add to their bench. Watson zeroed in on Mike Aldrete, a ten-year big-league veteran who was then playing for the Angels as a fourth outfielder and hitting just .150. But he was a career .260-ish hitter, who could play the corner outfield positions and first base. 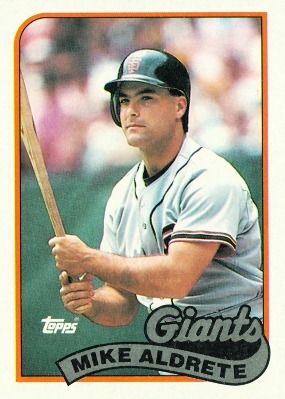 Aldrete had come up with the Giants in 1986. His best year offensively was his sophomore season, when he hit .325 and started in the Giants’ outfield. The Yankees would be his seventh and last big league team. New York manager, Joe Torre used Aldrete efficiently, getting him into 32 games during the second half of the ’96 season during which he got 77 at bats. Though he hit just .250 in pinstripes, he created some timely offense for the Bronx Bombers. In late June he had a key hit and RBI to help beat the second place Orioles. On July 1st, his home run off Roger Clemens was the winning run against Boston and four days later he drove in four runs to lead the Yankees to a rout of the Brewers. Tendinitis in Aldrete’s wrist benched him for pretty much the complete month of August but he was reactivated in September and played well enough to make the Yankees postseason roster as a left-handed pinch-hitter. He went hitless in his two pinch-hitting appearances in the World Series against the Braves, but he did win his first and only ring. The Yankees released him after the Series and his big league career was over. Watson lasted as Yankee GM until February of 1978, when he resigned and recommended his assistant GM, Brian Cashman, as his replacement. Before doing so, he advised Cashman not to take the job. Aldrete shares his birthday with this former Yankee second baseman and and this former Yankee set-up man. 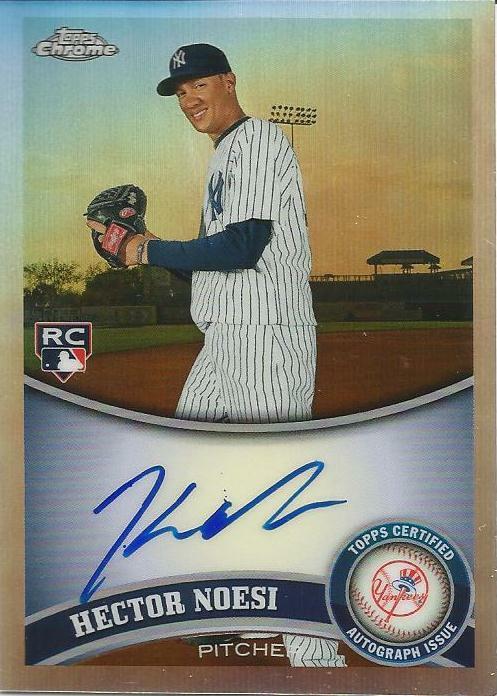 As the 2012 season approached, more and more Yankee fans were beginning to wonder if Yankee pitching prospect, Hector Noesi was really ready to become a part of the team’s starting rotation. That’s because it looked like New York’s front office was electing to stand pat with the pitching arms the team already had on its roster during this offseason and not test the trade or free agent market for a solution. That meant if Phil Hughes and AJ Burnett or the aging Freddie Garcia were not able to deliver during the first few weeks of the upcoming regular season, Joe Girardi’s first option was most likely going to be inserting Noesi in the Yankee rotation. This Dominican right hander had appeared in 30 games for New York in 2010 after being called up from Scranton in mid-May, almost all of them as a reliever. He made a good first impression when he got the win with a four-scoreless-extra-inning stint against Baltimore the very first time he pitched in the big leagues. He also had pitched well during his ascent through the Yankee minor league organization. Noesi has a fastball in the lower nineties and has already developed a very good change up. His delivery has been described by scouts as “smooth and fluid” and he has shown very good command of the strike zone. My problem with the guy was that he had already tested positive for steroids in 2007 and served a 50-game suspension. He’s tested clean since but he’s also experienced some serious problems with his pitching arm. Still, the Yankees were very high on this guy coming into 2012 and were telling everyone who would listen that he was ready to start in the big leagues right now. Some of that praise may have been hype to increase his trade value because in January of 2012, the Yankees included Noesi with Jesus Montero in the package they sent to the Mariners for Michael Pineda and a Mariner pitching prospect named Jose Campos. To date, Noesi has not pitched well for Seattle. He went 2-12 mostly as a starter for the M’s in 2012 and then spent large parts of his 2013 season pitching in Tacoma. Hector shares his January 26th birthday with this one time Yankee World Series hero. It didn’t take me long to become a huge Willie Randolph fan after the Yankees acquired the second baseman in a December, 1975 trade with the Pittsburgh Pirates. I did not appreciate how the Mets dumped Randolph as Manager during the 2008 season and I can remember being just as upset when the Yankees signed Steve Sax as a free agent to take over the starting second baseman’s job from Willie, after the 1988 season. Sax had been the NL Rookie of the Year for the Dodgers in 1982 and because he was good looking and did most of his ball-playing right next to Hollywood, you kept seeing him pop up on TV shows whenever a script called for a real ballplayer. But what he was most famous for was the mysterious case of the “Steve Blass” throwing disease he developed during the 1983 season. For those of you who don’t know, Blass was a Pirate pitcher who woke up one day and could no longer throw a baseball over the plate from the pitchers’ mound. I’m not talking about pitches ending up just a little bit off the plate, Blass’s tosses would regularly sale in all directions, five feet from the catcher. Sax’s throws were doing the same thing to his first baseman and it became such a running joke at Dodger Stadium that fans sitting in the box seats behind first base would show up wearing batting helmets. Dodger Manager, Tommy Lasorda tried everything he could think of to fix Sax’s problem. One of his remedies was a gag. Lasorda had a guy put the head of a greased pig in his second baseman’s hotel bed one night with a note threatening Sax with physical harm if he made another errant throw. Sax insists that pig’s head discovery straightened him out. Whatever. Sax did enjoy three productive seasons in New York from 1989 through 1991, topping the .300 batting average mark in both his first and final years in pinstripes. He also stole 117 bases as a Yankee. Sax was rewarded for his success in New York with a huge eight-figure, four-year contract with the Chicago White Sox. He was a dud in the Windy City, hitting just .236 in his first season with Chicago and getting released by the club the following season. Steve was born in Sacramento and turns fifty-two years old today. 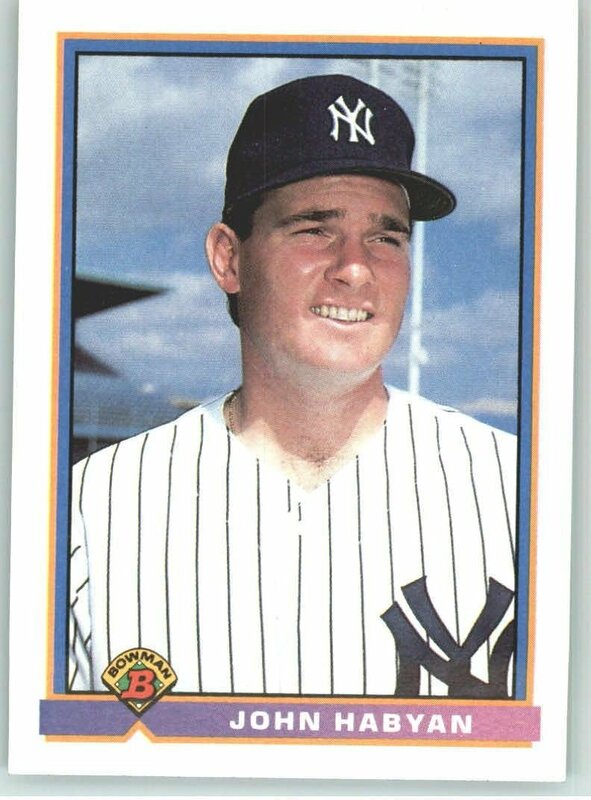 By the way, that’s former Yankee hitting instructor, Frank “Hondo” Howard, pictured with Sax in the above baseball card. Sax must have been standing on a step stool at the time this photo was taken because at 6’7″, big Frank was at least eight inches taller than Sax. Do you remember this other Yankee second baseman who developed his case of Steve Blass throwing disease while he was wearing the pinstripes? Sax shares his birthday with this former Yankee utility outfielder and this former Yankee set-up man.